This article was first produced as a booklet in July 1984. The history of the Church has been described as accurately as possible referring to the material discovered. If more information becomes available it will be incorporated in later editions. 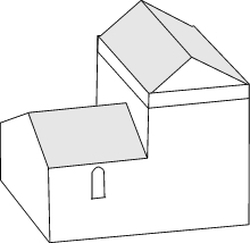 It is suggested that the visitor should start the tour of Box Church in the Chancel and then follow the guide around the Church using the diagram below. North Wall of the Sanctuary: This is the oldest part of the Church now visible, although even this small part has apparently been constructed in two stages and much altered. The remains of two small windows can be seen high in the wall. The western one is now distinguished only by its right hand springstone which is of an early design. This may be seen to the right of the present fifteenth century three-light window. The other small window, although complete, is obscured by a Northey memorial behind the altar, and is of a rather different and slightly later construction. Taken with the existence of a straight vertical joint in the stonework near the easternmost of these windows, and evidence of a line of foundations approximately under the reredos, it is inferred that the Chancel was extended eastwards in Norman times. Thus the western section of this wall may be the surviving relic of a building of the earliest Norman or even Saxon or Roman periods (see History notes below). Blocked Door: This pointed doorway on the north side was the entrance from the Chancel into the building which is now the Vestry. The Vestry was added in the fourteenth century. The Altar: The stone reredos (above) was given by Lt Col Coney and was dedicated in 1896. By coincidence, this is situated almost exactly at the east end of the earliest Chancel. East Wall and East Window: This wall was rebuilt in 1713 incorporating an earlier, reworked fourteenth century window (see left). This is the Pinchin memorial window showing the Ascension (Victorian stained glass). There is interesting nineteenth century cast plaster decoration on the lower part of the wall (below). This is behind the altar and can only be seen by entering the vestry. South Wall: The present south wall was rebuilt in 1713 incorporating an earlier door arch and jambs. This doorway is now blocked. 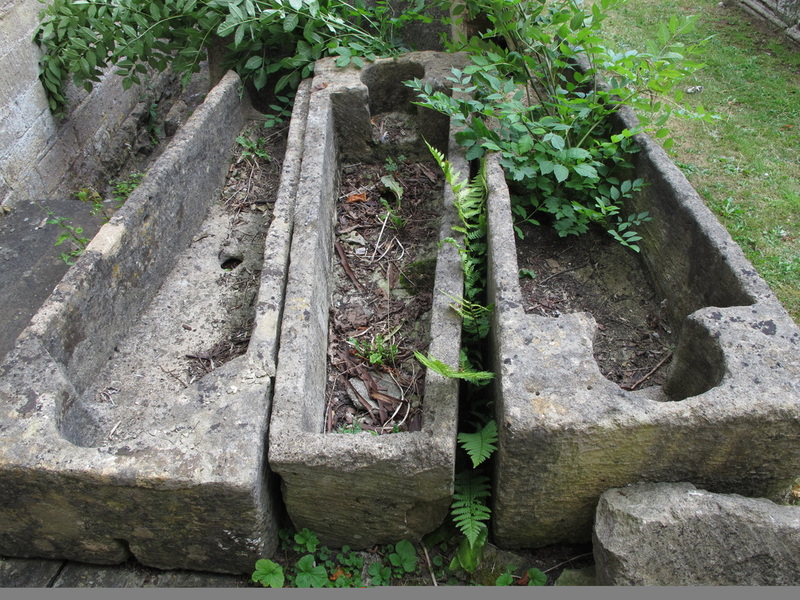 It was probably used for access to the churchyard before Box cemetery was opened in 1850. The south wall is some six inches (152mm) thinner than the original, as may be seen at its junction with the tower. South Window: This window (right) is also of 1713 in the Gothic style, very similar to those in the north aisle. It is the White memorial window and shows Jesus with the Children. Organ: This is housed in an extension to the south aisle built in 1898. It is a two manual pipe organ originally made by Griffen & Stroud of Bath. It was overhauled in 1939 and completely rebuilt in 1992 by Robin Winn with electro-mechanical action and major tonal revision, with the addition of several new ranks. By 2010 a number of problems had become apparent and a further stage of improvement was undertaken by a working party of members of the beneﬁce. (A separate leaflet giving further, detailed information is available in the church). North Tower Wall: This wall has two blocked doorways. The lower one gave access to the tower before the outside stair turret was built in the fifteenth century. The upper one gave access to a first floor room where the priest probably lived. (This upper doorway has a wooden lintel over it). The priest lost this accommodation when the tower arches were cut in the fourteenth century thus necessitating the building of new accommodation, the present vestry. The positions of the joist sockets of the floor joists are clearly visible on the north side at the base of the door, and, a little higher, those for the vaulted ceiling shown in the photograph of the Nave. Tower Arches: These beautifully proportioned arches (right) are a fine example of Early English architecture and were cut into the tower early to mid fourteenth century. They are very unusual in that the spring points (where the curve deviates from the vertical) are only some three feet (0.9m) above the floor level at the time. (This is probably for the practical reason that for structural stability the lines of shear at 45 degrees from the apex must remain within the width of the base). Screen and Rood: On either side of the chancel walls adjacent to the springing of the arches, there are two patches which mark the upper beams of the screen. This was probably removed at the time of the Reformation, shortly after 1538. 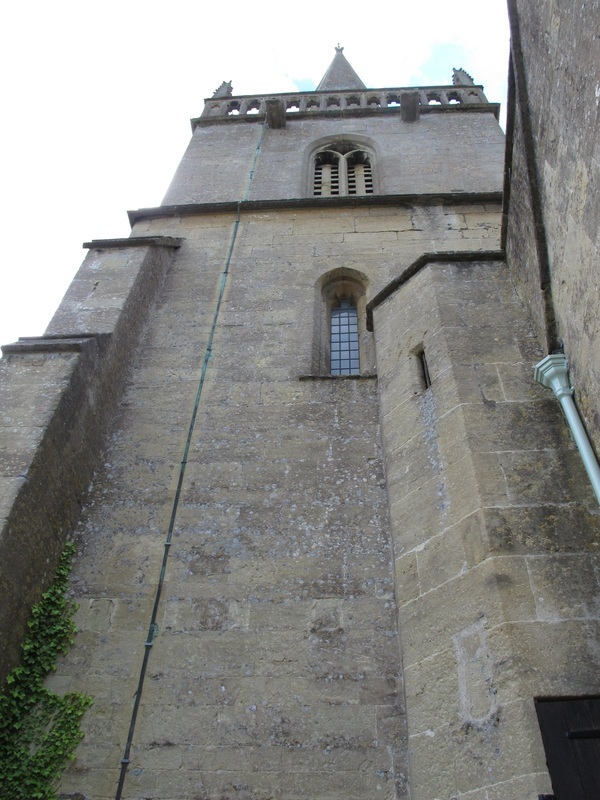 Higher up, on the arches, are two more patches marking the top of the screen or possibly the bars for the Holy Rood. In medieval churches, above the screen, there was often a narrow gallery called the rood loft which supported the Holy Rood, a brightly painted, carved image of the crucified Christ with the Virgin and St John on either side. Most of these were taken from the churches at the Reformation. The original Norman nave would have been narrow, some two to three feet (65cm - 1m) narrower than the present centre aisle. The few windows would have been high above the ground, deeply set and splayed, so that the area of light was only narrow. There would be no pews. As Churches were often the only buildings large enough for village meetings, the nave was often used for secular purposes, only the Chancel being consecrated. The entrance to the Chancel would have been blocked by the screen described above, with a locked door. 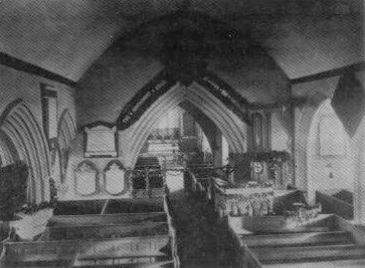 The photographs below show the nave before the 1896 restoration work. Note the boxed pews, curved low ceiling and the three-decker pulpit on the south side. Wooden Hatchment with the Arms of Queen Anne: Behind this hatchment (below right) is a blocked opening in the wall. This was reached from the stair turret and gave access to the rood loft gallery. It is thought to have been used by the priest to read the Gospel in English to the congregation (the Mass being celebrated in Latin in the closed Chancel). Parts of the hatchment were found in the ringing chamber of the tower as two separate boards. The third board was missing. Later the missing panel was replaced and the whole restored by G Coakley. The lozenge-shaped hatchment has the initials AR and the date of Queen Anne’s death in 1714. The Church was much restored in 1713 in Queen Anne’s reign and also she visited Hazelbury on one of her many visits to Bath. The West Window: This portrays St Thomas à Becket with King Henry II and a knight. Given by the parish in recognition of the incumbency of Rev TR Selwyn-Smith, it was designed and installed by John Potter in 1991 (see History below). Memorial Tablets: Above the lectern is a large memorial to the Neat family of Middlehill and one to Anthony Long (see notes on tomb at Hazelbury Chapel). Memorial Tablets and Roll of Honour: These can be seen on the left and right of the west door and honour those who died in the two World Wars. Here, there is also a list of all who served in the First World War with special annotations against those who enlisted before conscription was introduced. Brasses: Two brasses of note for their excellent eighteenth century engraving are to be found over two of the piers of the north aisle arcade. They are in memory of Thomas Goddard of Rudloe (1703) and John Rawlings Senr (1709). Carved Head: This may be seen over the central pier to the north aisle arcade (above left). It was probably inserted during the restoration of 1713 and is understood to represent George Millard (or Miller), Vicar from 1707 to 1740. Mothers’ Union Standard: This standard, to the left of the pulpit holds the reputation of being one of the most beautiful in the Diocese (above middle). The Hon. Mrs Shaw Mellor was Enrolling Member for Box at the time of its dedication by the Bishop of Bristol in September 1933 and Mrs Shaw Mellor herself embroidered the standard using her own wedding dress as the fabric base. In 1982 it became obvious that some of the threads of the banner were deteriorating and Jennifer Gill of the Bristol Workshops undertook the work of cleaning and restoring the item to its former glory. 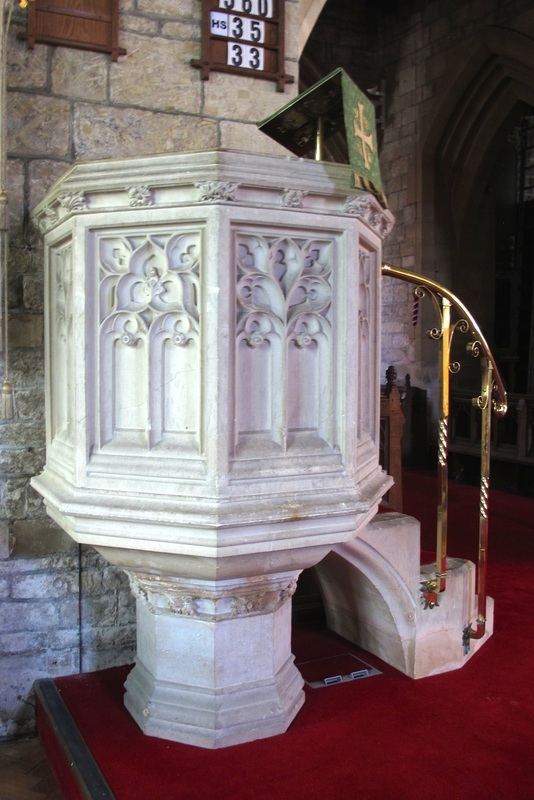 Pulpit: The stone pulpit was installed in its present position during the restoration work of 1896 (above right). It was a gift from the choir. This is one of the most interesting parts of the Church, although its origin is rather obscure. It probably dates from the end of the twelfth century and was originally built onto an earlier Church as a Thomas Chapel when the cult of St Thomas à Becket was very popular. Access to the original nave, evidently built only a few years before, was through a door in the north wall of that nave, see diagram below. The Chapel was at one time brightly painted; remains of red paint particularly can still be seen. There is a badly damaged wall painting behind the altar recess cloth; damaged perhaps by Cromwell’s soldiers in 1640? The rib vaulting and arches were constructed later than the Chapel, probably in the fourteenth century when the tower arches were cut. The abrupt cessation of colouring and the presence of somewhat roughly cut off stones indicates where the west wall of the Chapel has been removed. The origin of the Chapel’s name - Hazelbury - is unknown, but probably not of long standing. It may mark the generosity to Box Church of several owners of the adjacent manor of Hazelbury (see History). Tomb in Hazelbury Chapel: The tomb recess (below left) with its cusped arch is of the end of the Romanesque period and shows Byzantine influence. This dates it after the third Crusade, and, allowing for the lapse of time needed for new ideas to infiltrate the country districts, the tomb was probably built around 1260. It may be that of Sampson Bigod II de la Boxe, who is thought to have died about that time. The tomb had been demolished and plastered over but all the stones were found intact and the arch was re-assembled in 1896. 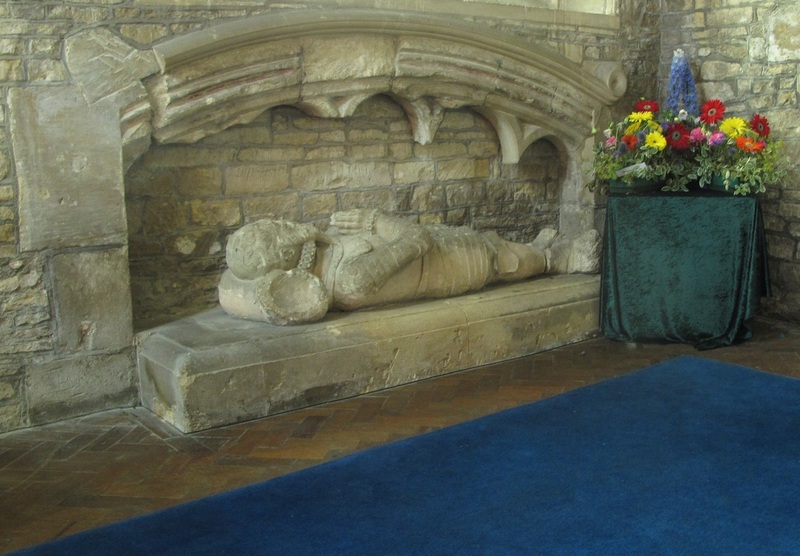 It is now occupied by the effigy of Anthony Long of Ashley who died in 1578. It was placed here during the restoration works of 1896, having been found under the old three-decker pulpit, (see photo at The Nave) for which it had been used as a support. The plaque to Anthony Long is still in the nave on the wall behind the lectern. 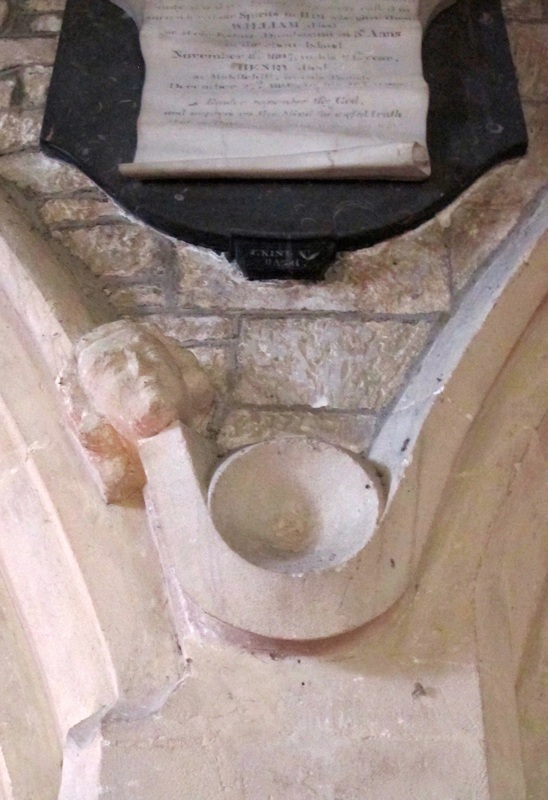 Corbel: A carved head, wearing a Bishop’s mitre, (above right) is at the base of the arch in the north-east corner of the Chapel. It was originally brightly painted. Jacobean Furniture: The altar table and coffin stool are Jacobean. Window in the North Wall of Chapel: This is the Gardiner Memorial window and shows the Good Shepherd. The stained glass is late Victorian. This is a good example of a traceried window of the early English period. It was restored in 1896. Eighteenth Century Embroidery: This is fixed on a blue background cloth in the altar recess and was probably the centre back of a cope. It is continental and is silk with silver on silk in the form of a cross. It was presented to the Church by the Hon Mrs Shaw-Mellor. This is the second north aisle. The original, with two church chambers over, was superseded by the present building in 1713. The north arcade is difficult to date; however, the straight vertical joint at the east end indicates that it is later than the adjoining wall. This arcade was built in two or possibly three stages as shown by the junction in the work over the centre pier and in the different sections of arch mouldings. The pier under the junction leans slightly to the west signifying that this was once the end of the arcade and was inadequately buttressed to resist the resultant thrust. Window to right of Door: This is the Coney-Pontifex memorial window (1927) showing the Resurrection. Bell Clappers: These together with an ancient coat of arms cut out of the tenor bell may be seen to the right of the north door (pictured at Bells below). In 1937 two cracked bells were re-cast and a chiming apparatus was installed so one person could ring all four bells. More details of the bells may be found below. Font: This is a mid-fifteenth century octagonal font with an elm cover. It is identical to those in Corsham and Colerne and is not the original. Many early fonts have been found in use as garden ornaments. Is anyone in Box using the original Thomas a Becket font as a bird-bath? Plaque on the West Wall: This Church was first built in 1200 and rebuilt in 1713. This can be seen high on the west wall of the north aisle. It was inserted in 1713. It does not represent the whole truth as there was certainly a Norman Church and probably an even earlier building on the site. Stained Glass in Baptistry: On the west wall is the Emra memorial window showing the Presentation in the Temple and on the north wall is the Watson memorial window showing St George with Faith and Hope. In 1831 the faculty (diocesan permission) was granted for the building of the south aisle. The application for the faculty was made by the Rev Horatio Moule. He said that the new aisle was needed because the population had so increased that the Church was no longer large enough. The aisle and gallery and convenient staircase were to be paid for by voluntary contributions. The gallery and staircase to it were at the back of the Church. 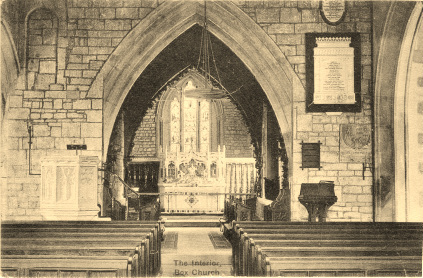 The aisle was completed in 1834. In 1998 the pews were removed from the east end of the south aisle. In 2013, plasterwork was repaired and the south aisle was re-decorated. Speke Memorial: These black marble slabs are on the south wall in an area which was dedicated in 1932 as the Children’s Corner and used as such for some years. They are memorials to George and Francis Speke. Sir George Speke died in 1682 and his epitaph (see card in Church), is said to have been composed by Edmund Waller who was an uncle of his mother. It shows the predominant part played in George’s life by his masterful mother, Dame Anne Speke. Francis Speke died in 1683. West of South Aisle: Two bays of the western end of the aisle have been curtained off, the pews removed and a cupboard for choir vestments and a sink unit added. This work was completed in 1974. and, at the time of writing (2014) is likely to be modernised. Hanging Monument: This is on the west wall of the south aisle and is carved marble. It is in memory of Margaret Blow and her husband. In the vestry is a Gibbs hatchment and several bequest boards (below right). See Benefactors below for details. This is written so that the visitor begins from the main gate and so is looking at the eastern elevation first. Chancel and Vestry: It can be seen immediately that the vestry building (below) is much older in appearance than the chancel and is domestic in style. The eastern chancel wall was rebuilt in the restoration of 1713 incorporating an earlier window. The vestry was built in the fourteenth century and was originally two storeys and almost certainly built as accommodation for the priest who hitherto had probably occupied a first floor room in the tower. The window in the east wall of the vestry is small and square headed and is an original fourteenth century feature. The upper storey room was lit by a narrow pointed window in the north wall. (The position of this can still be seen above the modern window). The door and porch to the present vestry can be seen on drawings by Sir Harold Brakspear in 1896). North Wall of Chancel: Of interest on this wall is the dormer which once had a window in it (below left). This may have been built to let light into the chancel when the earlier window was lost due to the building of the vestry. Tower (lower section up to the tiled string course): This was undoubtedly at the western end of the earliest Church. The walls at the base are four feet (1.2m) thick and slope inwards as they go higher. The small window is of the lancet type with a cusped head and is typical of the late thirteenth century. It is however a later insertion into the tower structure (note the uncharacteristic irregularity of the extrados, upper curved surface, of the arch stones). Bell Chamber, Spire, Buttress and Stair Turret: The bell chamber and steeply pitched octagonal spire were added about 1450. Note the crocketted pinnacles and pierced parapet typical of the decorated period of Gothic. The bell chamber has louvred windows on all four sides. To resist the additional horizontal thrust caused by the spire, the three buttresses were added at the unrestrained corners of the tower (the wall of the Hazelbury Chapel serving the purpose at the north-west corner). A stair turret was added to accommodate a circular stone staircase to the upper parts of the tower. The external door was inserted after 1790. The first bells appear to have been installed (about 1480) on completion of the building work, the St Katherine bell (see notes on Bells below) perhaps being the first as St Katherine is the patron saint of bell ringers. The bell frame is of medieval origin and is made of elm wood. It is listed Grade 1 independently of the Grade 1 listing of the Church itself. The top section of the spire was rebuilt and the weathercock re-gilded in 1988. Hazelbury Chapel: On the east wall it can be seen that the base is older than the rest of the wall. On the north wall of the chapel is the Gardiner window. The jambs and arch of this window are of fourteenth century date. However, the window was blocked at some period and the original tracery damaged. Fortunately the fragments were found within the infill, and new tracery exactly copying the original pattern was inserted in 1896. North Wall and North Door: The north wall was built in the course of the reconstruction of the north aisle in 1713. The inscription on the cornice is contemporary. The remarkable north porch which is in the classical style with Doric columns was inserted in 1760 and is now the main entrance. At one time the classical style of the door was denounced as ungodly. The centre buttress of the north wall was added in 1896 because of gradual movement in this wall caused by the loss of the west wall of the Hazelbury Chapel when the Chapel was opened into the north aisle. The windows on either side of the north door are 1713 in the Gothic style and are original. The bottom half of the window in the west end of the north aisle was converted into a door in 1814 and a flight of steps outside gave access to a gallery. The window was renovated in the alterations of 1896. The work of 1713 continues at the west of the north aisle as far as the buttress which marks the end of the north arcade. (It will be observed that the buttress is not actually square to the wall). The main gable of the nave is of the fourteenth century and contains a large window with tracery of that period. The window itself dates from 1991 - see The West Window above. The west door has an ornately carved arch of the Tudor period. This late perpendicular arch is much higher than the fourteenth century original and cuts the sill of the window above. Considering that the oak door has been enlarged to allow for the lowering of the floor by about one foot (305mm) in 1896, the original door must have been very small. This was formerly the main entrance of the Church and an ornamental gate pillar can be seen in what is now Box House garden. The garden was glebe land but was enclosed when Box House was built as the vicarage by Dr Horlock, vicar of the time, in about 1810, after fire destroyed (in uncertain circumstances!) the original vicarage. The stone infill between the gables on the west elevation no doubt represents an attempt at classicising the wall. On the west wall of the south aisle there is a shallow porch built in 1840 in the Gothic style. It has a pattern of blind arcading over the door. The base of the wall between here and Box House has been identiﬁed as Roman masonry. The south wall of the south aisle is neo-Gothic in style and was built in 1834 (faculty granted in 1831). The south wall of the Chancel was rebuilt in 1713 and is in the same position as its predecessor but is some six inches (150mm) less in thickness. The window is of the time in neo-Gothic style. The doorway, now blocked, may have re-used an earlier frame. 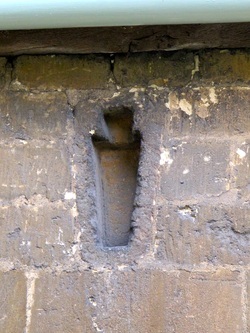 Window in Tower: This is of the lancet type with a cusped head and is typical of late thirteenth century. Like the window on the north of the tower, it has been inserted later into the tower structure. Memento Mori: This carved coffin (above left) can be seen in the wall slightly to the west and over the top of the blocked doorway. It was to remind everyone that death is always near. It was built into this wall of 1713 and could itself be very old. Mass or Scratch Dial: This is to the west and above the coffin, on the tower (below left). Its inscription reads, Horas non numero nisi serenas. (I only tell the shining hours). Three Stone Sarcophagi: Of interest here, against the Chancel wall, are three stone sarcophagi with no lids (above right). These are thought to have been brought from the original Hazelbury Church and may be Saxon in age. Only monuments of historic or aesthetic interest are mentioned here. Against the south wall are the seventeenth century Speke family (of Hazelbury Manor) headstones and on the eastern boundary is the Bowdler family gravestone. Mrs Bowdler was the mother of the editor of the Family Shakespeare. 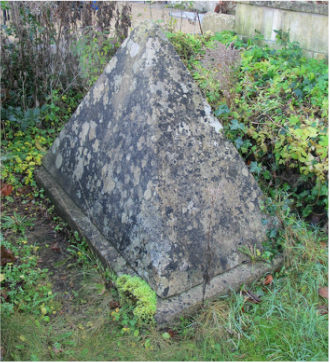 Of interest is the pyramid-shaped tombstone in the SE corner of the Churchyard. It is said that it was built like this to prevent the occupant’s wife from dancing on his grave! Many mounds can be seen on the south side of the Church. 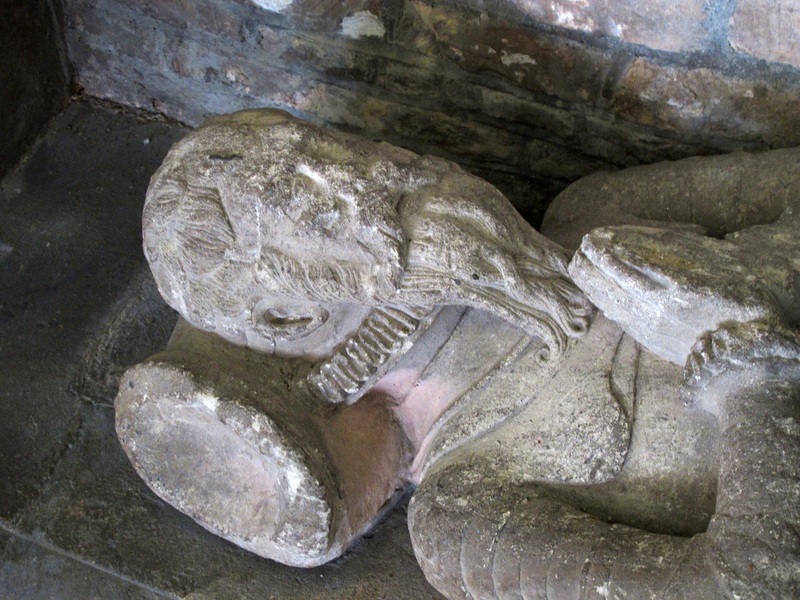 This may be because of the medieval custom of burying people on top of others and always on the south side as no-one wanted the shadow of the Church to fall on his grave. In 1858 Box cemetery was opened and few burials took place thereafter in St Thomas à Becket churchyard. The Churchyard was officially closed in 1858, approved by Queen Victoria at Windsor. In January of that year the vicar’s wife, together with her sister and a servant died rather suddenly. 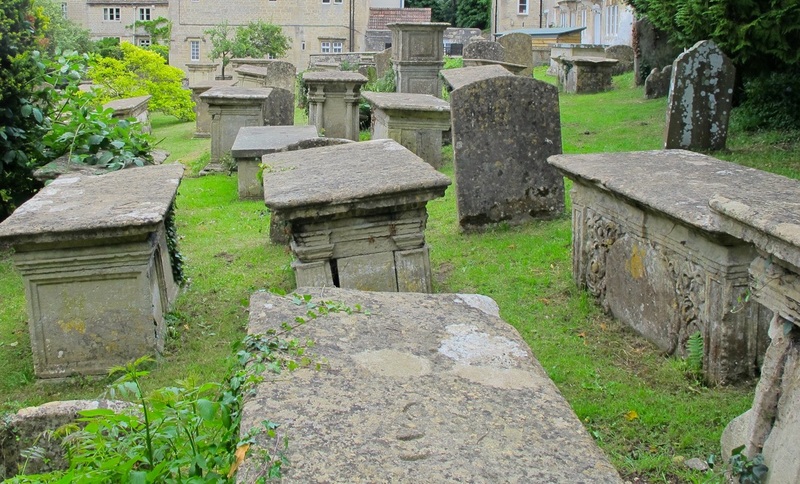 Subsequently, their deaths were thought to have been caused by contaminated water emanating from the Churchyard, hence its closure. However, about seven memorials have inscriptions subsequent to that date due to internments into family tombs which were already in place. To the north of Box Church is the site of a huge Roman villa. A fine mosaic pavement was found in the churchyard in the last century. Recent research suggests that the west wing of the Roman Villa extended exactly to the north wall of the present Chancel. Since, at the date of the later villa, its occupants were required to be Christian as a condition of citizenship, and, following the example at Lullingstone Roman Villa in Kent, it seems likely that the foundations of the Chancel are those of a house Church of the Villa, dating to around 390 AD. If this is so, even though occupation has probably not been continuous, Box Church may be one of the earliest Christian foundations in the country. Christianity was widely established in Britain by the 4th century but fell largely into abeyance until the arrival of St. Augustine of Canterbury in 595. It gradually spread again over England during the centuries before the Conquest of 1066. St Aldhelm, Abbot of Malmesbury in 673, built the Abbey in Malmesbury using stones from Hazelbury. Aubrey records that St Aldhelm rode to the site, threw down his glove and told the people to dig and they would find great treasure. This treasure was the building stone and later the stone was transported for use via the By Brook and Avon rivers. 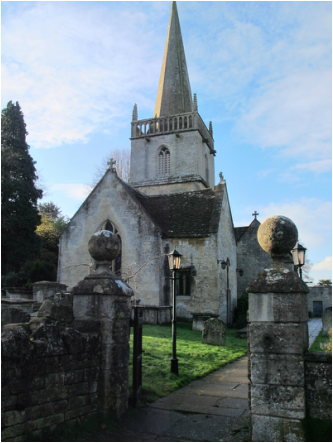 St Aldhelm was responsible for the building of the Saxon St Lawrence Church in Bradford on Avon; built with Hazlebury stone. 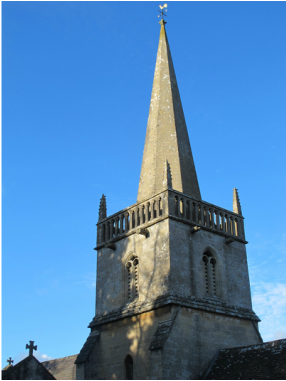 Certainly the Churches in the adjacent parishes of Corsham, Hazelbury and Bathford are all of Saxon origin. The earliest part of the present visible Church is the north wall of the Chancel or at least the western section of it on the inside. Unfortunately, owing to the extent of later alterations, it is not possible at present to date this with any great certainty. The tower up to the lowest string course is somewhat battered (tapered upwards from the base) and was originally constructed without buttresses. This style is typical of a modest chapel of the early Norman or even Saxon period. Thus the first identifiable Church may well have consisted of a squat tower, having accommodation for the priest on the first floor, and a very small Chancel on the east side. The remains of joist sockets and the door leading to the former first floor may be seen inside the tower. There was undoubtedly Norman work on the site as a well finished zig-zag arch of that period was discovered by Sir Harold Brakspear during the underpinning of the South Aisle in 1896. The Norman Church has disappeared almost entirely at least above ground level. There is some empirical evidence that its south wall was slightly inside the position of the South Arcade, with the north wall some two feet (0.6m) inside the present north arcade and extending westwards to the extent of three of the present four arches. It is known that from 1144 to 1158 Box was held by the Earl of Hereford, Humphrey de Bohun III. He was well known for his pious benefactions. It was Maud, wife of Humphrey de Bohun II, who designed and founded the Priory at Monkton Farleigh in 1125 for Cluniac monks of the Order of St Benedict. In view of the family’s record of ecclesiastical building, it is probable that Humphrey de Bohun III made some contribution to the construction of the Church. In 1158 the Manor returned to the King and was granted to the Bigod family. In Aubrey’s writings of Box Church he mentions, By the three graduall stone seates is a lyon rampant, in stone, with a cross crosslet on his shoulder. These three seats have now gone but a lion rampant appears on early Bigod family seals and this indicates that the Bigod family were involved in the building of the Church. Indeed, a Charter of 1189 confirms that a boundary in the Hazelbury Quarry was an ancient (ie at least 20 years old) excavation and from the Bradenstoke Cartulary we know that this was made by Radulphus (Bigod) de Boxa. It therefore may be assumed that substantial building work was carried out on the Church between 1158 and 1169. An interesting fact is that Hugh Bigod, Earl of Norfolk and head of the family, was excommunicated by Thomas à Becket in 1169. It was about 1190 that the cult of St Thomas of Canterbury (martyred 1170) arose. Pilgrims came from afar along the established routes of which the Box valley was one. It is conjectured that the Hazelbury Chapel was constructed as a Thomas Chapel at this time, with access via a door in the north wall of the Norman Church. This Chapel may incorporate earlier work at the base of the east wall. At one time the roof pitched east-west, ie the opposite direction from the present. Baalam's Passage reputed to be the path from Box to Monkton Farleigh. In 1227 the Prior of Monkton Farleigh was given the patronage of Box Church by Bartholomew Bigod de la Boxe, Lord of the Manor. The document recounts that on 3 February 1227 Bishop Richard (Poore) by permission of God the humble minister of the church at Sarum was declared bishop over the church at Boxe juxta Ferlege (Farleigh) with the consent of the Prior and Convent of Ferlege. The priory was already using the mill (on the present site of the house, The Wilderness). The footpath from the site of the Priory in Monkton Farleigh to Box Church can still be traced. There is some confusion about the early dedication of Box Church (see also below). A deed of Walter Croc III who succeeded to Hazelbury in 1190 and became a monk in 1219, gives land by the Chapel of St David (which is said to have stood on Box Hill) to the Church of St Peter at Box. It has therefore been assumed that Box Church was dedicated to St Peter. This deed, however, follows the convention of the time in giving to the mother Church not the local dependent Chapel. It may therefore indicate no more than that Box Church was a chapel belonging to St Peter’s but this is open to conjecture. The early fourteenth century was the great age of Church building and Box was not ignored; the Church was substantially altered. The Chancel arches were cut in the east and west of the tower. The first floor accommodation was thus lost and a new two-storey building in domestic style, (the present vestry) was added north of the Chancel, with direct access. The Church was extended one bay westwards and the present west wall and window constructed. A similar window was built at the east end. The north arcade, or at least two bays of it, was constructed outside the old wall no doubt so that the roof could be retained until construction was complete as well as giving a wider centre aisle. The vaulting was added in the Hazelbury Chapel. No trace can be found of the rest of the old north aisle, although it is known that until 1713 there were two rooms over it, known as the Church Chambers. In the latter half of the century the squat tower was transformed into the present elegant structure by the addition of the bell chamber with its crocketted pinnacles and pierced parapet of the decorated period, surmounted by the octagonal stone spire. This imposed an additional thrust due to the extra weight so necessitating buttresses at three corners of the tower. A stair turret was added to give access to the bell chamber but access was only from the interior until after 1790. The bell frame of elm wood was built about 1480 and the ﬁrst bell, now number 3, was hung, soon followed by number 2. Please refer to the additional notes about the bells later in this article. The traditionally small west door was replaced with a new frame and door in the late perpendicular style, with its flattened arch. In order to give increased headroom, the arch cuts the sill of the earlier window.It is likely that the interior of the building was substantially changed by the Reformers in the reign of Edward VI with the removal of religious images and the ﬁgures of saints, destruction of the rood screen and whitewashing of the interior decoration. There appears to have been little change in the fabric at the time. Bells numbers 1 and 4 date from the early years of this century. Please refer to the additional notes about the bells later in this article. The Rev G Millard (or Miller) appears to have been an energetic incumbent; he founded the school in 1707 and set up charities to finance it, as well as teaching until a master was appointed several years later. A major scheme of restoration to the Church was instituted in 1713. The south wall of the Chancel was rebuilt entirely. The earlier wall may have been damaged by earth pressure, the soil standing several feet above internal level, (the soil was finally cut back in 1830). Unfortunately for posterity, the gradual seats on the south wall, mentioned by Aubrey, were not reinstated. The eastern wall of the Chancel was also rebuilt incorporating the former east window. The illustration above dates from 1790. The other major work concerned the north aisle. The old aisle with the two first-storey rooms known as the Church Chambers was swept away. 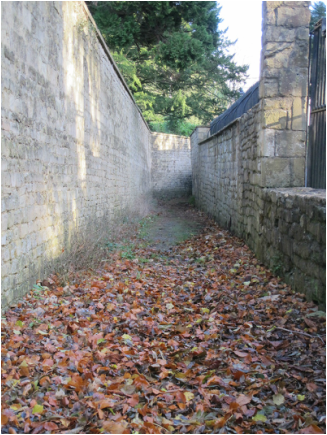 The wall separating the Hazelbury Chapel from the north aisle may have been removed at this stage. A new roof was built over the whole north aisle and Hazelbury Chapel. A document of 1783 recognizes the separate dedication of the east end of the north aisle but the name Hazelbury is not used. The west window of the aisle appears to be original, reinstated and re-worked as was the Chancel east window. At this time the centre aisle had a vaulted plaster ceiling and the space between the chancel arches was closed in to the profile of the arches with plasterwork, giving, to the modern eye, a curious tunnel-like appearance. Some incidental work was carried out on the detail of the north arcade, (note the carved head of the period). In 1760 the present remarkable Doric north door was inserted, and this became the main entrance, thereby avoiding the need to walk through the former Vicarage garden to reach the west door. In 1831 the Faculty was granted for the building of the South Aisle, a gallery and a staircase to the gallery. The South Aisle was needed because the Church was not large enough for the congregation. In November 1896 it was recorded in the Devizes and Wiltshire Gazette that Box Church was crowded with hideous appropriated pews and with more hideous galleries carried up nearly to the roof with access to one through a window. It was through the exertions of the new vicar, the Rev White that restoration work under the supervision of the architect Harold Brakspear, was carried out in 1896-97. The work included the removal of all the old galleries which blocked up the North Aisle and much of the nave. 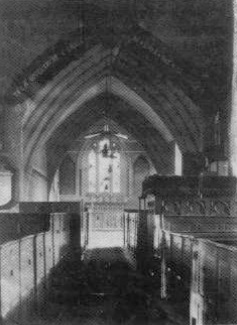 All the high old pews (see photograph above inder the Nave) were replaced by ones of pitch pine. The floors were lowered 12 inches (305mm) and the whole surface concreted and wooden blocks placed in the nave and aisles. It was during the lowering of the floors that the effigy of Anthony Long was discovered propping up the old three-decker pulpit (below left). When the walls were stripped of their plaster the recessed wall tomb and the altar recess, both in Hazelbury Chapel were discovered and restored. Anthony Long’s effigy was placed in the wall tomb and so is away from his plaque which is still in the nave above where he was discovered. A stone pulpit, a gift from the choir, was erected and new English Oak clergy seats, lectern and choir stalls were installed. The coved ceiling in the tower arch was removed and was opened up to the floor of the ringing chamber. The organ chamber was built in 1897 and the organ installed the following year. The Chancel was altered with the positioning of the stone reredos and altar considerably westward of the east wall, leaving vestry space behind. The reredos, given by Lt Col Coney was dedicated in 1896. The Margaret Blow Memorial on the north wall of the Chancel was removed and re-erected in the South Aisle so as to open the three-light fifteenth century window which it had hitherto entirely blocked. The tracery and mullions had been removed but now the window was completely restored. It was only when the plaster was removed from the Chancel that it was clear that the north wall was the oldest part of the Church. The floor of the chancel was lowered, also in the works of 1896, and fragments of thirteenth and fourteenth century encaustic tiles were found embedded in the underlying fill material, indicating that the floor had at some time been raised above its earliest level. The porch was added to the vestry during this restoration of 1896, again to Harold Brakspear’s drawings. This gave new access to the Chancel. The cost of the whole work, including heating and lighting, was around £3,500. In 1926 the Hazelbury Chapel was restored and re-appointed in memory of Joan, daughter of the Hon Mrs Shaw-Mellor. Owing to damage to the original frame caused by the largest bell swinging out of true, three of the bells were re-hung in 1936 from steel beams built into the north and south walls. Only the front of the choir stalls which stood here during the twentieth century now remain. These were designed by Harold Brakspear. The remaining stalls and the lamps, the latter having been installed in 1984 in memory of Mr Stanley Currant, were removed in 2007-08 during re-ordering of the chancel. In 1991 the ﬁne new west window was erected by the parish in recognition of the incumbency of the Rev TR Selwyn-Smith. The re-rooﬁng of the nave and south aisle and the complete re-building of the organ took place in 1992. In 2002, the heating system was updated, with a boiler in the vestry replacing the one in the boiler room under the SW corner of the Church. Previously the boiler was periodically submerged due to the stream which runs through an open drain in the bottom of the old boiler room! In 2004, a sound ampliﬁcation was installed and ﬁtted cupboards were added in the outer vestry in 2005. The organ was further restored in 2010. In 2011, cracks were discovered in the stonework of the bell tower. The load was relieved by the insertion of simple steel frames which bear on four of the original 15th century putlogs or scaffold holes. The steel frames were designed in sections small enough to be carried up the spiral staircase. Work was completed in 2012. In 1503 John Bonham I of Hazelbury left to the Church of Box 6/8d and one of the best of all my cows. Churchwardens were to have the custody of the cow and to pay the Vicar at Easter 4d for writing John Bonham’s name in the Bede Roll and recommending his soul on Sundays and 8d on his anniversary. The Vicar received 6/8d for praying for his soul and the holy water clerk received a legacy of 2d. John Bonham requested that he was to be buried in the parish church at Box before the image of the Holy Trinity. In 1707 Dame Rachel Speke gave the set of Communion plate. Sums of £100 each given by four members of the Speke family and Mr Miller of Jamaica between 1711 and 1727 were spent in 1733 to buy land and build a barn for the use of Box Charity School (founded 1707). In 1728 Henry Hoare of Stourton gave £200 for a Poor House and a large room within for the Charity School. In 1844 John Neat of Middlehill gave £300 to support 10 old men and 10m old women parishioners. In 1851 Anne Holworthy of Newtown House (now Heleigh House) gave £100 to support 6 old persons of the parish and of the Church of England. Boards listing benefactors and apparently dating from the nineteenth century, are in the vestry on the south wall. A book of those who contributed to the west window in 1991 is stored in the vestry. 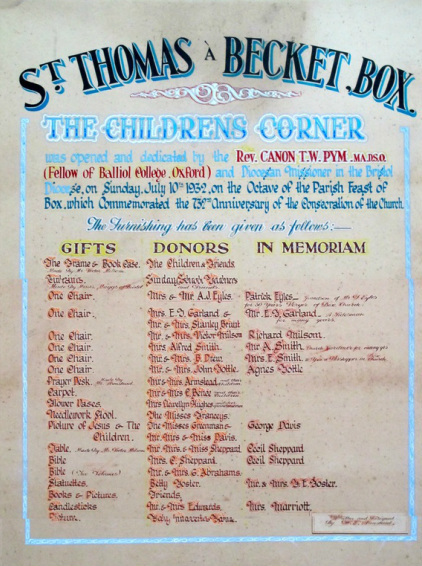 Benefactors of the Children’s Corner in 1932 (see right) are on a board stored in a chest in the south-west corner of the nave. A chained book lists subscribers to the installation of electric light in 1935. There are four bells in the tower. In November 1936 three were removed for tuning and repair and the photograph (below left) was taken. From left to right they are, number 1 (treble), number 3, number 4 (tenor). Number 1, the treble bell is 35 and a half inches (89cm) diameter and is dated 1617. It has the inscription ‘ANNO DOMINI 1617’. Number 2 is 39 and a half inches (1m) diameter and has the inscription ‘AL PRAISE BE+GEVEN TO GOD TG’. This is believed to be pre-Reformation, the TG being the initials of T Gefferies. Number 3 is 43 inches (109cm) diameter and has the inscription - ‘SANC : TA : KA : TE : RI : NA : ORA : PRO : NOBIS R+T’ (Holy Saint Katherine, pray for us). Walters believes this to be a Bristol bell of about 1480 - 1500. Number 4, the tenor, is 47 inches (119 cm) diameter and has the inscription - ‘LAUS. DEO. VN. ET. TRINO. INSECVLAR. SECULORVM’ (Praise God, the One and Three for ever and ever). This bell has a vine border above and the Royal arms and 1610 below. Numbers 1 and 4 have no name or initial but they are believed to be either by Roger Purdue, Bristol, 1601 - 1640 or Richard Purdue of Glastonbury, 1600 - 1640. St Thomas’s Day is December 29th. It was decided, because of Christmas, that this was not a convenient date for the purposes of keeping the Dedication Festival. The date of the parish feast was therefore changed from December 29th to July 7th. (This is the date when St Thomas à Becket’s bones were placed in a shrine in Canterbury Cathedral). This was the origin of the Box Revels which for centuries were observed on July 7th. First a service was held in Church and then were was a procession to the Holy Well of St Thomas a Becket. From the well the procession descended to the By Brook before returning to the Church. Gradually the religious character of the Festival lapsed and a day of drinking and merriment was celebrated well into the nineteenth century. The Revels were suppressed by an Act of Parliament in 1822, following a riot, but were partially revived in aid of Box School in 1864 and 1865 when the records of the School show that in those years there was poor attendance on July 7th. Box Revels have subsequently been revived once more but are now held on the Bank Holiday weekend at the end of May; they have become an important local event. This latest revival began in 1984 when money was raised for major alterations to Box School. Since then many of the village’s numerous organisations have benefitted.